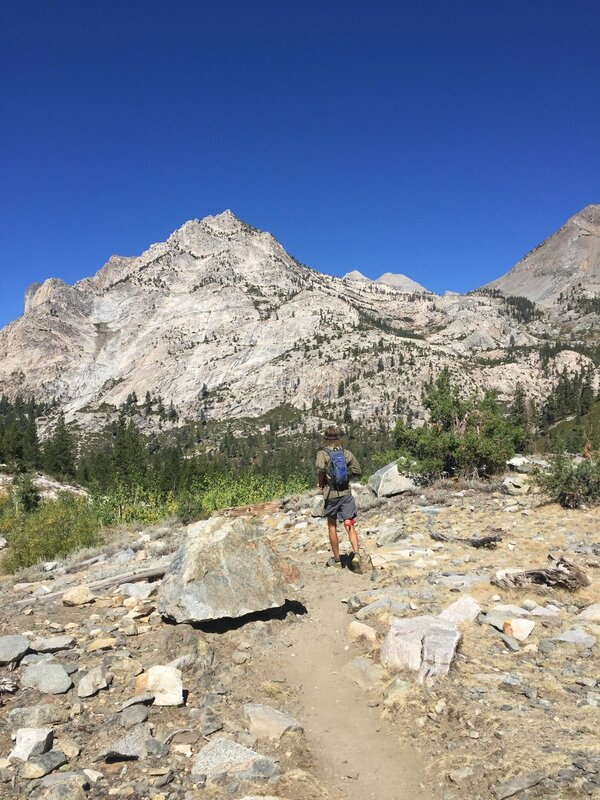 The Rae Lakes Loop is a premier backpacking route in the heart of Kings Canyon National Park. This 40 (ish) mile loop climbs from around 5,000ft to nearly 12,000ft of elevation at Glen Pass. Most people take anywhere from 3-7 days to complete the loop, but Cosmo and I decided this would be a great single day run to celebrate my 35th birthday. 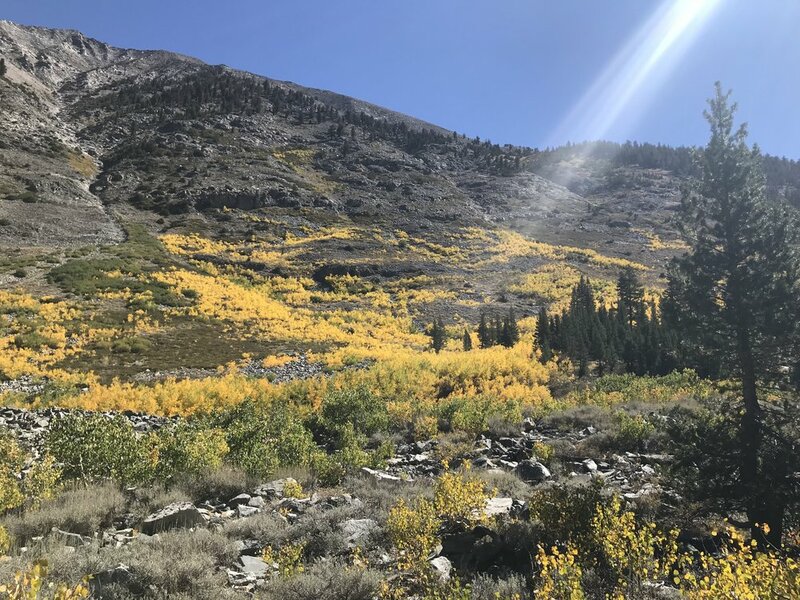 We left Thursday morning choosing the scenic Highway 395 and entered into Kings Canyon NP from the Eastern Sierra via Kearsarge Pass. My pack felt heavy on the hike up to Kearsarge Pass. Extra running pack, subway sandwiches, and beer were all necessary birthday weekend camp essentials. 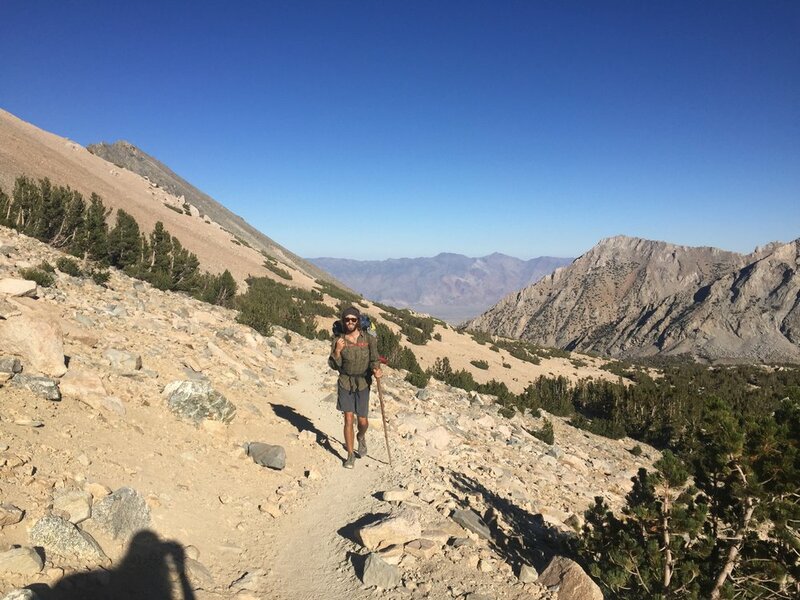 We got over the pass in time for sunset and reached a juncture with the Pacific Crest Trail. We paused for a moment to take a look around. The last time we were at this juncture the trail sign was submerged under water and the trail was surrounded by seasonal lakes. The landscape was different now, much more baron and dry. We took a short side trail down to Charlotte Lake where we set up our home base for the weekend. The sky grew darker as we made our way down to the lake and I was struck by the serene silence of the wilderness. 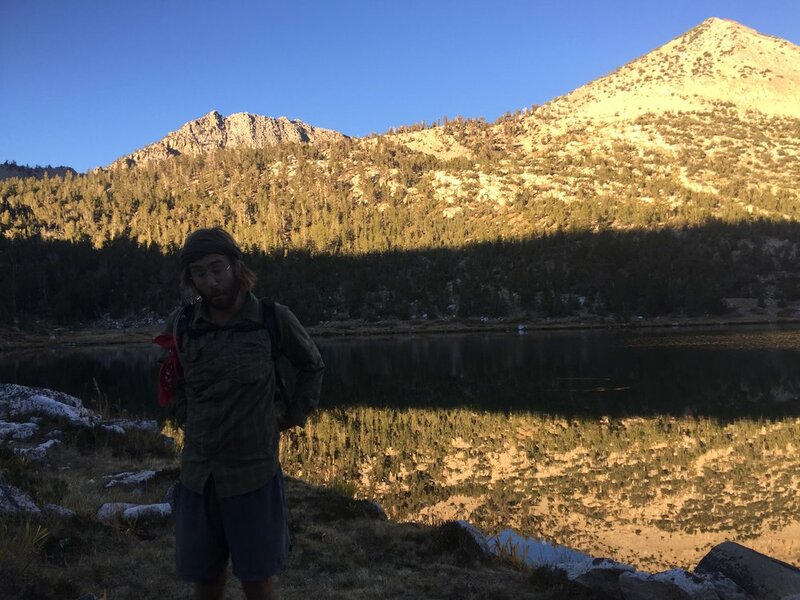 The complete silence of the Sierra helped me sleep soundly through the night and I woke up feeling refreshed and ready to go at 5:30am. I could only see darkness through the mesh of my tent and I could feel an autumnal chill in the air. I skillfully dressed from inside my sleeping bag, taking advantage of the warmth. I heard the flame of Cosmo’s stove and soon the aroma of coffee wafted its way up my nose. We started early enough to watch the glow of the sun begin to light the tops of the mountains around us. After a couple of hours the sky filled with the light and the warm sun caressed my body and thawed my frozen fingers. Within the first few miles we reached Glen Pass, the high point of the loop. This late in the year, most of the snow was gone and from the top of Glen Pass we gazed out at miles of jagged granite peaks towering above crystalline lakes. 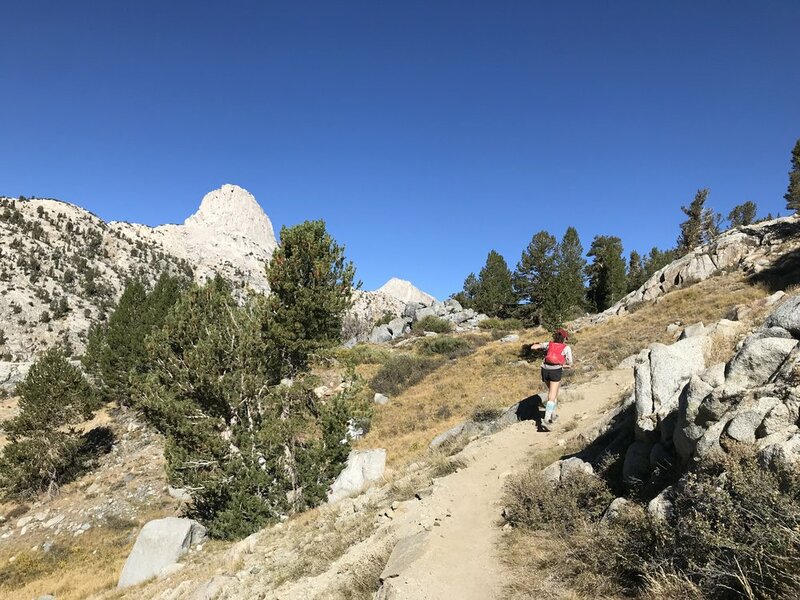 I felt strong summiting Glen Pass, giddy as I ran down toward Rae Lakes Basin. As I ran down the switchbacks toward the lakes I passed several enthusiastic and curious backpackers, “You are doing the loop in one day? !” was a phrase I heard a lot throughout the day. I met another Larry along the way! We hadn’t been out for more than a few hours but the lakes in the basin were too difficult to resist, despite the crisp air. We stopped for lunch and took a shocking jump into the frigid mountain waters. 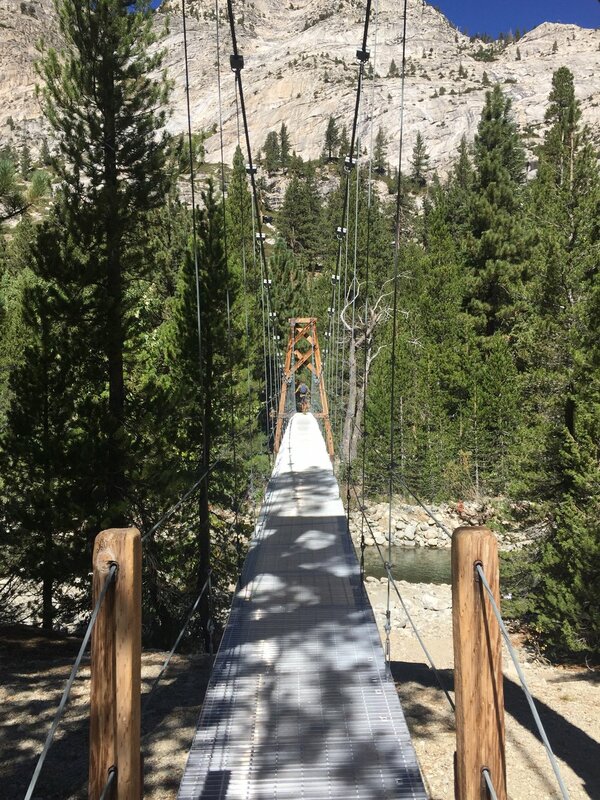 The trail descended for the next 20 miles, crossing the infamous PCT/JMT suspension bridge, curving around countless lakes and traveling through numerous aspen groves. Our running pace slowed significantly during the last half of the loop, as the trail abruptly began to climb at Road's End. We stopped for a mini break to fuel up with delicious Snackaroons (compliments of Heathers Choice). The last 10 miles were a seemingly never-ending set of strenuous switchbacks. The scenery never ceased to be stunning. The trail traveled alongside Bubbs Creek, with cascading white water flowing fiercely through the glacially-carved canyon. We continued to climb as darkness fell around us. We took several breaks to sit down in the silence and gaze up at the arrival of abundant stars. My stomach started to grumble and I found myself daydreaming about the soggy subway sandwiches that were waiting back at camp, tinfoil-wrapped at the top of our bear canisters. We finished the loop around 10pm. I was exhausted and nearly collapsed into my tent. Although my quads were pulsating and my calves felt like ankle weights, I was filled with joy. These are the moments when I feel most alive - the relief at the end of a long journey, the feeling of accomplished exhaustion. I was ready to close my eyes, not even sure I’d be able to eat the sandwich I had been dreaming about. But when Cosmo took out the vegan cinnamon bun he had been holding onto as an end-of-the-run birthday surprise, my stomach caught its second wind. My eyes widened and the cinnamon bun was devoured almost as quickly as I saw it. We were in no rush to leave our scenic campsite. We spent our last day in the Sierra taking it slow and exploring an unfamiliar trail leading away from Charlotte Lake. 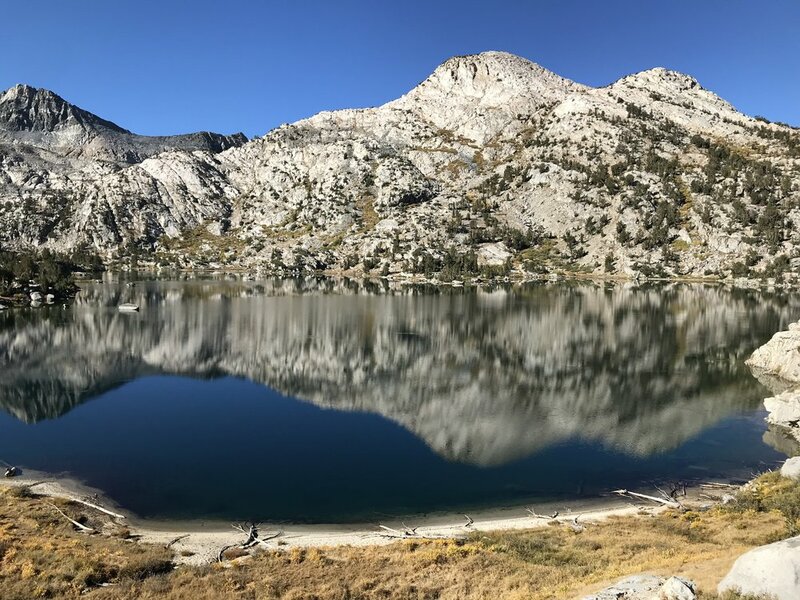 There is no shortage of enticing lakes and scenic Sierra vistas along the 7 mile hike back to the car. We took our time and soaked in the warm sun and the rejuvenating serenity of nature!